How to reach Nainital from Kathgodam | How to reach Nainital, Kausani, Mukteshwar | Haldwani- entrance of Kumaun | Adventure Guides in Nainital | Nainital travel guide | Uttarakhand Travel Guide | Travel guide & Adventure guide in Nainital. Many people are feared about which way and how to go for Nainital from Delhi, the questions people ask me are- train from Delhi to Nainital, train from Kathgodam to Nainital, a direct bus from Delhi to Nainital, how to reach nainital from Delhi and many more questions related to Delhi to Nainital journey. If you too have the questions similar to other people, then read this article till end. When coming from Delhi with Train the route is as follows- Ghaziabad, Rampur, Rudrapur, Haldwani, Kathgodam. From Kathgodam hilly area starts, and there is no train in hilly areas of uttarakhand. So the queries- Train from Delhi to nainital and train from Kathgodam to Nainital are invalid, train is available till Kathgodam only. If you are coming from Delhi, UP, Or any other part of India for Nainital, Mukteshwar, Pithoragarh, Almora, Bageshwar, Kausani, Bhimtal, Sattal, etc., then the nearest railway station for these place is Kathgodam Railway station. 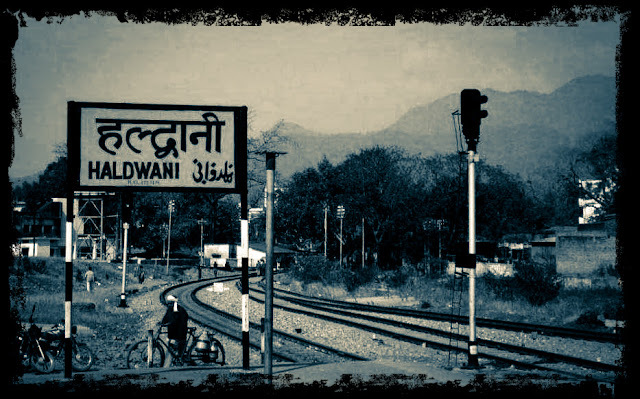 In the honest opinion of uttarakhand adventure guide one should get off the train 5 kilometers before the Kathgodam at Haldwani railway station. Now the question arises how to go to Nainital or any other famous hill station from Haldwani. There are two regular ways from Kathgodam to reach Nainital. One route is from Haldwani - Nainital via Jeolikote ( a 35 km route). Mostly Uttarakhand Transport corporation buses operate in this route and they charge Rs 65/- for this journey. And the other route is from Kathgodam - Nainital via Bhimtal ( a 40 km route). You will get shared taxis, private buses along with government buses on this route. On Haldwani- Nainital route via Bhimtal one has options to visit Naukuchiyatal, Bhimtal, Sattal, Chamfi, etc.Kindly note that you have to go 5 kms extra for Naukuchiyatal, 8 kms extra for Sattal and 6 kms extra for Chamfi, although Bhimtal is on the way. For going Mukteshwar from Haldwani one has to take the Haldwani- Bhowali via Bhimtal route and has to take a Ramgarh - Mukteshwar route half a kilometer before reaching main market Bhowali. Private buses and shared taxis are available from Haldwani for Mukteshwar but are very limited in number. Although you can hire a private taxi. Distance of Mukteshwar from Haldwani is 75 kms and it roughly takes 3 hours to reach. Kausani, a famous hill station in the foothill of Himalayas is situated at a distance of 52 kms from the ancient town Almora. For reaching Kausani from Haldwani one can get a sufficient number of private buses, shared taxis and government buses, apart from these one can also hire a private taxi for Kausani. The route to Kausani is- Haldwani- Bhowali - Almora- Kausani. Kausani is at a distance of around 140 kms from Haldwani and it roughly takes 5 hours to reach. Apart from Almora route, there is one more route to Kausani that is via Ranikhet. Going on The Almora route, you will find Neem Karoli Maharaj Ashram, Kainchi, A must visit place. An ashram that inspired Facebook's Mark Zuckerberg and Apple's Steve Jobs.